New, free gear is coming to Fortnite for Twitch Prime subscribers, so be ready to pounce! You can never have too much Fortnite loot. That's why Epic Games and Twitch have teamed up once more to bring players a new backpack full of Fortnite treasure. 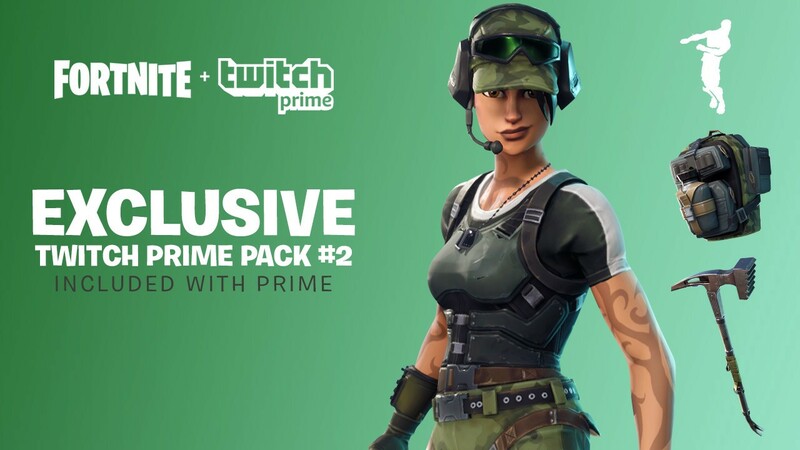 Starting May 9, Twitch Prime subscribers can log into their accounts and the Fortnite Twitch Prime Pack #2, which is burgeoning with tons of outfits, weapons, and more. Simply log in to Twitch tomorrow, then claim Twitch Prime Pack #2 from the main menu on your Twitch account. You'll then need to load up Fortnite, where your loot will automatically be delivered to you, so long as you've tied your account together with Twitch. You can find out how to do that here. Not up on what Twitch Prime actually is? You get it automatically with your Amazon Prime subscription, and it nets you free stuff for various games each month as well as ad-free Twitch viewing and a free channel subscription every 30 days. You just need to remember to resubscribe with it and give it to your favorite streamer when it runs out. All set? Make sure you grab these goodies tomorrow. You wouldn't ever want to say no to free stuff!